This Ex- Demo model has been rarely used and is a condition of 9/10. The new battery-operated Duocut 41 N-ERGY walk behind mower gives professional users a means for efficient, environmentally friendly and profitable mowing. This is a high-quality multifunctional mower which is environmentally responsible, compact, rugged and efficient. It can easily handle collection, mulching and mowing. This specific bundle consists of the mower, battery and charger, grass box and mulching plug. All of which are normally sold separately to this machine. 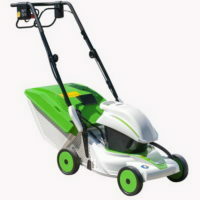 The duocut offers a sizeable 41cm cutting deck and plenty of power to cover up to 2 hours of mowing in one charge. Features a 56 litre grass box and many more features besides for more information visit the Etesia website by clicking here.